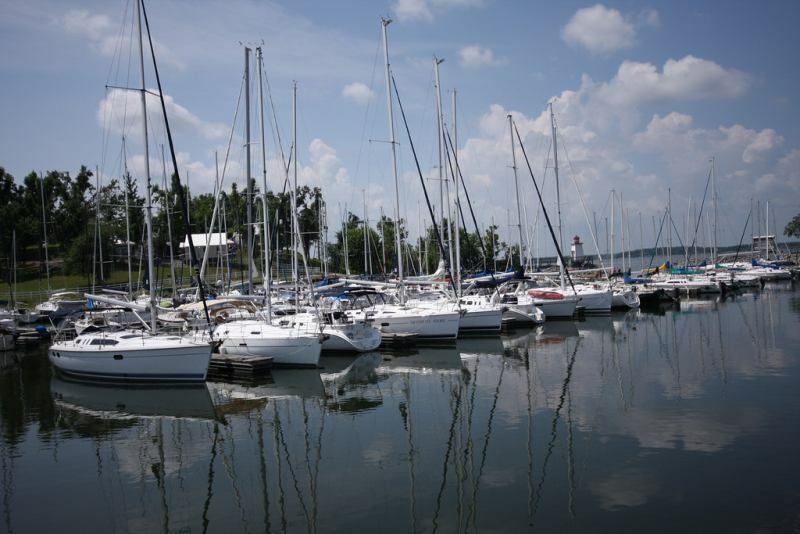 Boats in the Lighthouse Landing Marina in Grand Rivers, Kentucky! The following GREAT safety tips were written with the 4th of July weekend in mind and are provided by the Land Between the Lakes Forest Service Law Enforcement Officers. Be courteous at all times, especially around boat ramps. Be aware of your surroundings.Ã?Â According to the U.S. Coast Guard, driver inattention is the number one cause of boating accidents and deaths. Ventilate the inboard motor before starting the engine to release any gas fume build up. Engage your carÃ¢â?¬â?¢s emergency brake when pulling out or lowering your boat into the water. Be responsible for the safety of your riders; ensure availability of life jackets for each and keep within legal weight limits. Do not drink alcohol and operate a boat. Be courteous.Ã?Â Share the road with bicycle and motorcycle riders. Watch out for wildlife, especially deer since they tend to travel in pairs and often feed along the highways.Ã?Â Also watch for hikers, horse riders, and mountain bikers that cross the roadways.Ã?Â Take extra caution when approaching these cross-over areas. Stay on designated roads as identified in LBLÃ¢â?¬â?¢s Motor Vehicle Use Map (MVUM). These roads are numbered.Ã?Â The map is located at http://www.lbl.org/mvum.html. Keep a map with you to guide you through the numbered backcountry roads. Be aware of your surroundings.Ã?Â Heavy rains may wash out sections of creek crossings or roadways. Be sure to carry sufficient water to keep hydrated. Know where you are and where you are going before you head out. Plan ahead and inform a responsible person of your route. Carry a map and a compass or a global positioning system (GPS) unit with you. Some cell phones may not work in all areas. Use tick, chigger, and mosquito repellant. Be aware of the high fire danger associated with hot, dry weather. Be courteous to other campers.Ã?Â Honor quiet hours from 11pm to 6am. Before setting up your camping site, look to see if any tree limbs may be ready to fall in strong winds and adjust accordingly. Fireworks are prohibited in Land Between The Lakes.Ã?Â Neighboring State Resort Parks provide fireworks displays visible from many places at LBL. Forest Service Law Enforcement Officers are on duty to help keep Land Between The Lakes a safe place to visit.Ã?Â In case of emergency, dial 911 or 877-861-2457 for 24-hour dispatch.Ã?Â Visitors are asked to immediately report any unusual smoke that you see or smell. More safety tips can be found on the U.S. Forest Service safety website at http://www.fs.fed.us/safety/ and at the U.S. Coast GuardÃ¢â?¬â?¢s Boating Safety Division http://www.uscgboating.org/default.aspx.Ã?Â Visitors can find information about tick safety on our fact sheet at http://www.lbl.org/documents/2012LBLTickFacts.pdf.Ã?Â Site and trail maps can be found at http://www.lbl.org/VCMaps.html.